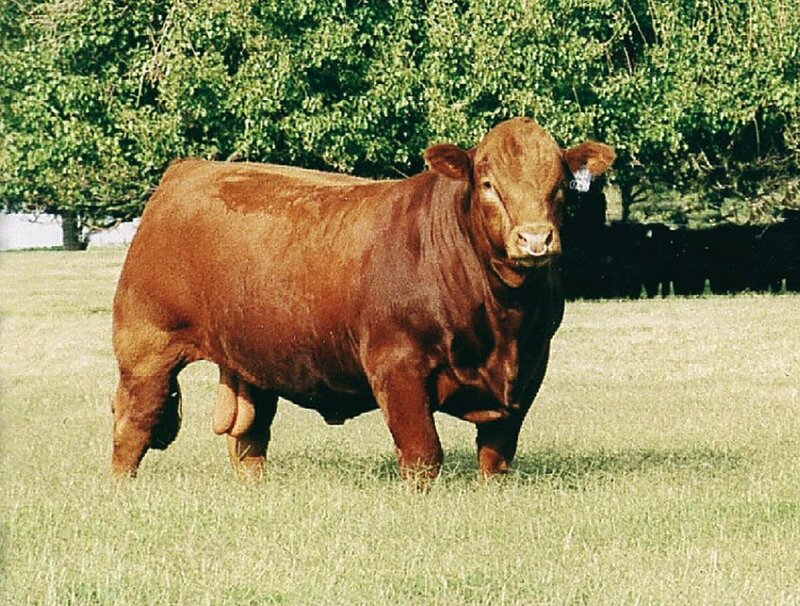 Beef cattle are generally sturdier, meatier and larger than dairy breeds. In addition, they may have stronger maternal instincts, because in several systems the dam suckles her calves for several months. In dairy farming, calves are usually taken from the dam within 24 hours from birth. The information here is referenced from the website of Oklahoma State University and from other sources. 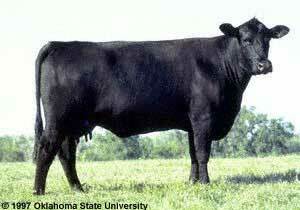 Angus or Aberdeen Angus is a medium-sized beef breed with either black or red coloring. Grows slower and gains fat faster than larger breeds. 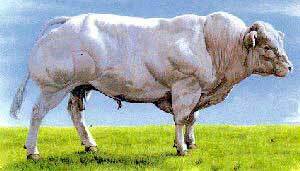 Belgian Blue has a mutation, which causes it to be double-muscled. The extreme size of its muscles causes severe problems when calving, and most cows must undergo several cesarean sections during their lives. Blonde d'Aquitane, or blond, is a muscular and docile breed. 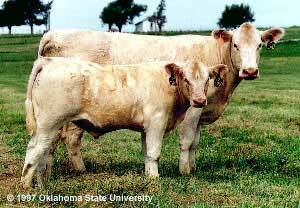 Charolais is a white or cream-colored, large beef breed from France. It grows fast and generally gains fat slower than smaller breeds. Herefords are massive, red and white colored animals. The head is usually entirely white and covered in curly, thick fur. Grows slower and gains fat faster than larger breeds. 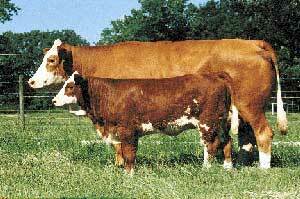 Simmental is colored much like the Hereford, but the head is usually not entirely white. It is originally from the Simme Valley in Switzerland. It grows fast and generally gains fat slower than smaller breeds. 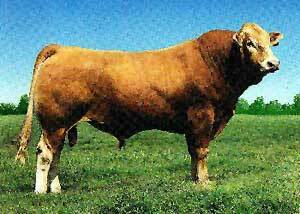 Limousin is another French beef cattle breed, and has originally been used as a working animal as well as for beef production. It has a high carcass percentage, i.e. the ratio between carcass weight and live weight. It grows fast and generally gains fat slower than smaller breeds. In addition to the EUROP-scale, the fatness of the carcass is evaluated from scale 1 (fat-free) to 5 (extremely fatty). Two important concepts to consider are live weight and carcass weight. Live weight is the weight of the entire animal. Carcasss weight is live weight minus the weight of the head, genitalia, udder, digestive tract, internal organs, hide and hooves. The ratio between carcass weight and live weight is called carcass percentage. Carcass percentage varies between breeds, but is commonly 50-60 %. When the carcass weight increases, to which the farmers often aim at, the relative proportion of lean meat decreases. In proportion, the amount of fat increases. The portion of the most valuable cuts (steak and filet) from the entire carcass does not change. Carcass weight can be increased by using plenty of concentrated feed, but a more effective method is to limit fattening by limiting energy intake at the finishing phase of the rearing. Muscle becomes meat or beef after the animal has been slaughtered. Slaughtering causes chemical, physiological and biological changes in the muscle tissue. To prevent harmful changes, the animal and the meat must be handled correctly. Meat becomes stringy and chewy when the myocine and actin filaments of the muscle stick together after death (rigor mortis). Usually carcases are cooled under +7 C before rigor mortis sets in, which causes the muscle to constrict due to cold. To prevent cold constriction the meat may be stimulated with electricity. Once the meat is cooked, the proteins break and the meat becomes tender. is related to the amount of fat in the meat, since fat increases the water retention capacity. 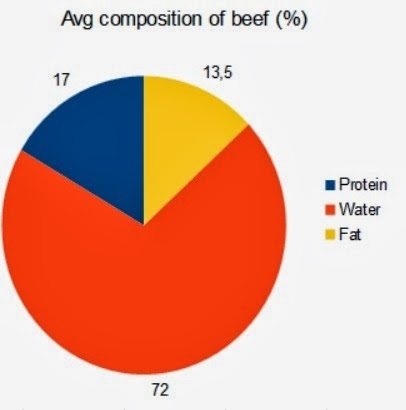 The largest part, 64-80 %, of beef is water. The water is retained between actin and myocin filaments. Water retention capacity decreases as the pH decreases after slaughtering. The pH of muscle is 7,2, but it drops to 5,6 within 24 hours after death. Fat percentage varies between 2-25 %. If the animal has little glycogen in its body right prior to slaughter, the meat does not develop enough lactic acid after slaughtering and the pH does not drop as fast and low as it should. This results in a tar meat, or DFD meat (dark, firm, dry). DFD meat is not used for whole-meat products because it has poor shelf life. Its a very good and informative post for the farmers. As a farmer, I always checkout your blog for getting information about the animal breeds, their feed and care. It s really helpful.